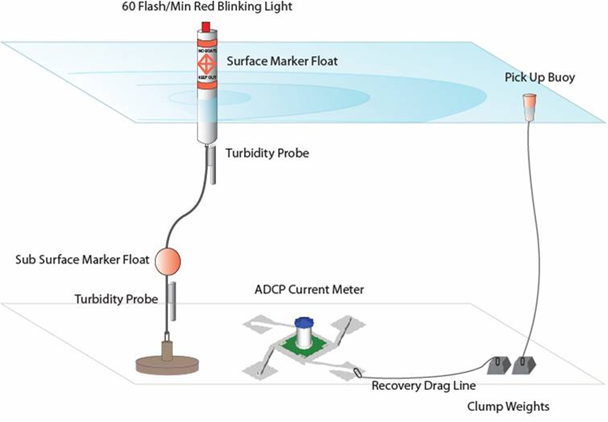 Contaminated Sediment Cleanup Monitoring | Sea Engineering, Inc.
SEI and Battelle Memorial Institute coordinated efforts to monitor water quality and bathymetric variability during the Ashtabula River navigational and environmental cleanup project. The project was located in Northeast Ohio and the survey area encompassed approximately 1 linear mile. River depths varied between 1 meter and 8 meters. SEI performed initial, progressive and final multi-beam and side-scan sonar surveys during the project. In addition, SEI obtained progressive water quality measurements (flow speed and turbidity) upstream and downstream of dredging operations; and water quality moorings were deployed upstream and downstream of the project to measure background conditions at the project extents. Battelle and SEI worked closely in the coordination, inspection, and assessment of the geometry of the side walls of recent dredge cuts using an Odom Hydrographic Echoscan 30-beam, 3º multi-beam sonar system. A C-MAX 780 khz side-scan sonar provided qualitative imagery (and quantitative positioning) of notable features (e.g. dredge cuts) and hazards. Radial dredge furrows that resulted from dredging activity were clearly visible in the bathymetric and side scan survey data. Slumping of recently dredged banks was identified by comparing sequential bathymetric profiles along the sidewall surveys.